ASGCO® Conveyor Training School (ACT™) offers classes created to provide your team with the highest quality training to solve your conveyor problems. Each day your team will spend classroom time discussing the most common conveyor issues such as mis-tracking, spillage and dust control. The remainder of the day is spent in our hands-on conveyor training room, installing components on a full size working conveyor. Our experienced staff will show your team the ease of installing and maintaining ASGCO conveyor components. We can also develop the training course to meet your particular conveyor needs. And if you have a specific conveyor problem, we will teach you to discover the real issue, find out what others have done, brainstorm multiple solutions and implement the best one. • What is fugitive material and it’s causes and associated problems. • Problems with carry-back, belt mis-tracking, spillage, dust and costs of fugitive material. • Material wear liners: where and why? Having trained service crews to maintain and service your conveyor systems is extremely valuable – whether it’s your employees and contractors when working on site, to keep conveyor systems continually running longer and producing more, today’s service crews must be up-to-date on all of the latest splicing, installation, service and maintenance technology. ASGCO provides onsite and classroom training in conveyor safety, certified splicing and component installation. Maintenance programs also are available. Additionally, each training session is customized to ensure that participants increase their skill levels and knowledge base as needed, to improve their level of service to customers. 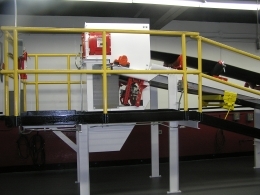 Conveyors are the lifeline to an aggregate plant’s productivity. This training class will provide the “Conveyor 101” program that has proven successful at facilities across the country. Conveyor systems, conveyor belts, their components and how they affect your plant’s performance. Safety guidelines for working on or around conveyors. Tips on reducing fugitive material and dust (and solutions to control it)\Ideas on how to implement a conveyor inspection and maintenance service program that works for your plant. …and much more! Our training program can be customized to fit your needs. Sign-up Today For Conveyor Training School! For information on pricing and to arrange a session, please contact us immediately as classes are filling up. ASGCO® can create a custom training program to meet your needs. …I just wanted to drop a quick line and let you know how much we appreciated your time and instruction during our recent visit with ASGCO in Allentown. The accommodations we witnessed there were excellent and the learning experience second to none. 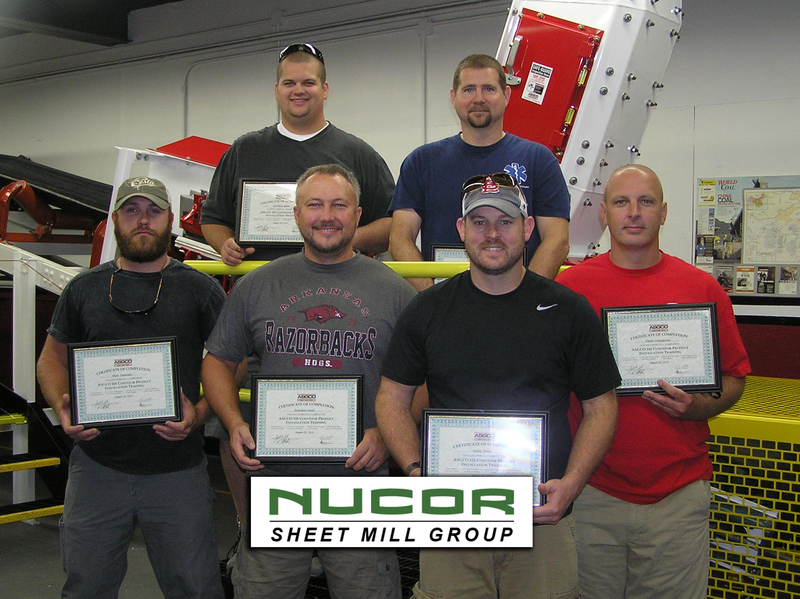 Your knowledgeable professionalism was impressive and well received and our experience and time there was and will continue to be beneficial and valuable to our crews here at NUCOR. Moving forward, we look forward to maintaining a great working relationship with your company and have already begun planning improvement and upgrading strategies for our conveyor systems thanks to your training, recommendations, and experienced council. The innovative ASGCO equipment we learned about and the hands on instruction you gave will without a doubt, greatly improve our performance potential here. There have been nothing but rave reviews for you all from our side and the next crew we have scheduled to visit Allentown look forward to it excitedly. Nucor Steel, Arkansas MS Mech. …I have been in the business for over twenty two years and I have installed countless belt cleaners, skirting systems, idlers and almost anything that pertained to conveyor systems and never has any company or salesman taken the time or concern to show me the exact proper installation of these items, yes I can read instructions but in real life you tell yourself how hard can it really be and you throw it in walk away than constantly say “that thing sure doesn’t clean very well” let’s put a couple more turns on the tensioner or maybe we can stop the coal fines from coming out of the skirtboard by cramming the rubber skirting further in the coal flow. I hope you can get the message out to all end users how to properly install these products; it is sure refreshing to know you can count on someone after the sale. Please feel free to use me for any reference for your business. …Thanks for the training and hospitality we received from ASGCO. I thought the class was excellent, the hands on training and seeing the quality of your products was impressive. It beats the hell out of trying to sell out of just the catalog. Now I can explain the quality of the products, the ease of installing and maintaining, etc. …Hope your week is off to a good start. Just wanted to thank you and Mark again for putting on a great training class last week. We really appreciate the hospitality and professionalism that we were shown while at your facilities. The classroom portion of the training was very informative but we really enjoyed the hands on training on the operational conveyor. I feel ASGCO’s primary cleaners are head and shoulders above some of your competitors and look forward to trying a couple of them here at Sandow. I believe once properly installed they will sell themselves. 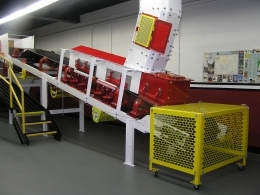 ACT™ Conveyor Training School will provide valuable knowledge with conveyor fundamentals, safety and efficiency.